Pisang lies in the north of the Manang valley and is another popular peak among the trekking peaks in Annapurna region. This peak, which has formed a shape of a pyramid in the summit, lies on the way to the highest pass of the world offering a better chance for exploration. Trekking to this peak can be combined with the classic Annapuran Circuit Trek, which is suitable for someone with a little experience in climbing. The summit of the peak offers spectacular views of the Annapurna, Tilicho Peak, Annapurana II and IV, Ghangapurna and the Glacier Dome. The route to Pisang Base Camp takes you through the Upper Pisang Valley with sparse woods, pastures and crystal clear lakes along the view of the Himayalas. The trekking starts from Besisahar along the valley of the Marsyangdi river which has diverse flora and fauna throughout the route until reaching the peak. The upper part of Pisang is guarded by huge rock slabs making it difficult to be climbed on especially in wet and snowy conditions. This peak is considered as one of the most technically challenging peaks among other climbing peaks in Nepal but rewards you with a memorable sense of achievement along with the breathtaking views of the snowcapped giants standing majestically. The favored months to climb up this peak are April, May, October and November depending upon the nature of visibility and the weather conditions. As this trekking expedition is somewhat difficult, it is recommended you carry along insulated boots, abseil device, climbing helmet, crampons, ice axe and alpine harness. We will drive to Besisahar(760meter) from Kathmandu and then to Chyamche (1430 meters above sea level). From Chyamche we will trek to Bagarchhap(2160m above sea level). From Bagarchhap we will head towards Chame(2670m above sea level). From Chame we will head to Pisang (3200m above sea level). From Pisang we will trek to Pisang Base Camp(4380m above sea level). We will spend the day resting at Pisang Base Camp and explore this breathtaking place. From Pisang Base camp we will head towards Pisang High camp(5400m above sea level). We will reach the summit o fPisang peak and head back to Pisang Basecamp. 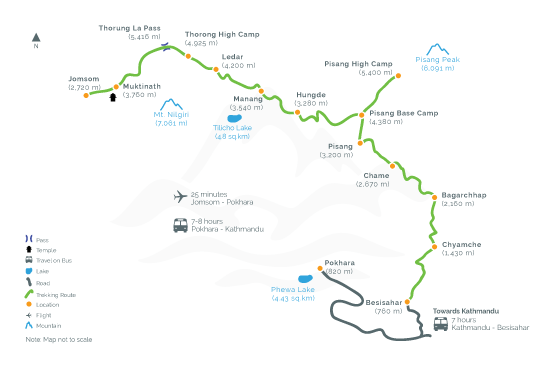 From Pisang basecamp we will head towards Hungde(3280m above sea level). From Hungde we will trek to the magnificent valley of Manang(3540m above sea level). From Manang we will head towards Ledar(4200m above sea level). From Ledar we will trek to Throng High camp(4925m above sea level). From Throng High Camp we will trek to the highest pass of the world, Throng La (5416m above sea level) and then head to Muktinath(3760m above sea level). From Muktinath we will head towards Jomsom(2720m above sea level). We will take a flight to Pokhara from Jomsom.